Имате въпрос към Nilaveli Beach Resort? Разположен в Плажна ивица на Нилавели, Nilaveli Beach Resort е перфектно място да почувствате духа на Тринкомалее и околностите. Хотелът се намира на 20 km от центъра на града и осигурява достъп до важните места на града. С удобното си местоположение хотелът предлага лесен достъп до всички градски забележителности, които задължително трябва да се видят. Nilaveli Beach Resort също така предлага много съоръжения за обогатяване на Вашия престой в Тринкомалее. Подбор на съоръжения от най-висока класа като 24-часова охрана, ежедневно почистване, наем на преносимо Wi-Fi, експресно настаняване/напускане, съхраняване на багаж, са на разположение за Вас в хотела. Влизайки в една от 8 уютни стаи, ще забравите за ежедневния стрес с помощта на удобства и съоръжения като безплатен чай, хавлии, дървен/паркетен под, безплатно разтворимо кафе, огледало в някои от тях. Хотелът предлага прекрасни развлекателни съоръжения, такива като гмуркане, риболов, градина, водни спортове (моторизирани), водни спортове (немоторизирани), които ще направят престоя ви незабравим. Когато търсите удобно и комфортно място за настаняване в Тринкомалее, изберете Nilaveli Beach Resort, който ще се превърне във втория Ви дом. Отель прекрасный, конечно дороговато, но все номера с видом на океан, красивый ресторан на берегу с вкусной кухней. Отель из 8 номеров. Расположен на пляже, кругом тишина, полный релакс. Рядом ничего нет. Выехать в Тринкомале на тук туке туда и обратно от 1500 до 2000 рупий. Океан спокойный, волн не было. Ужинали в ресторане отеля. Отдыхали на восточном побережье в сезон дождей с 10 по 21 мая, дождей не было. Если вы готовы отдохнуть от людей, города, шума, приезжайте в Nilaveli Beach Resort. The hotel was beautiful, staff perfect and food excellent. It is at the far end of the beach, but everything is easily reachable with tuk-tuk. Because of the seasons in Sri Lanka, be aware of the time of year when booking. If you like a quiet and relaxing time the winter months are good, if it is a more active time then the summer season is perfect. But whatever season you decide to travel I would recommend this hotel. This resort is so quiet and small. Only about 20 rooms and a deck chair for everyone overlooking a calm, safe beach. Not much to do outside the gates so bring a book (Internet not the best). 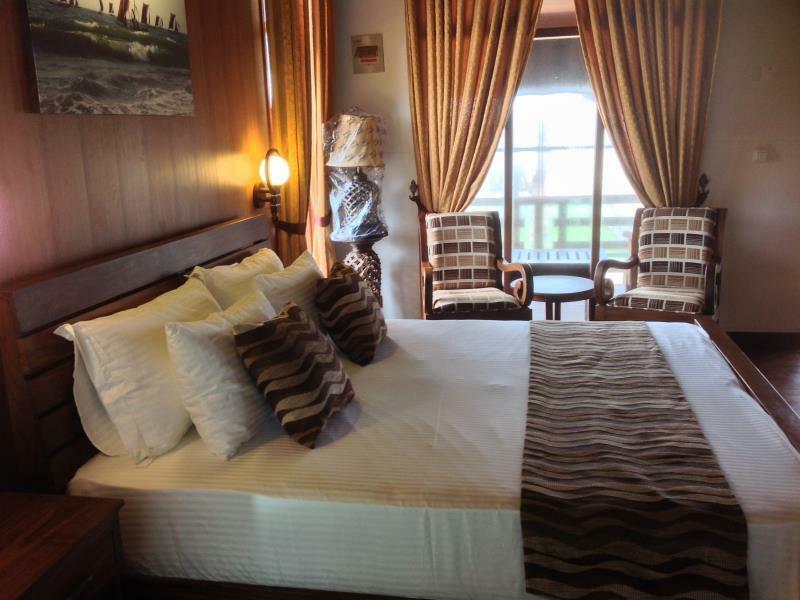 The rooms are well appointed and clean with a balcony leading right onto the sand. Staff (surprisingly, all male) were attentive and the chef was happy to accommodate my dietary requirements. There is no pool but when the sea is so calm, warm and safe it would seem superfluous. A nice break from the constant travel and sight seeing. Отседнахме 9 вечер/и в март 2017 г.
I loved this place. We had a lovely and fantastic stay. Only the restarant could be better at night. We had the fish plate and for a location right on the beach I expected more. Everything was good except no TV in the Room. Young Children are looking some entertainment. The rooms, beach and sun loungers at Nilaveli are picture perfect .. but "resort" is slightly misleading. It's very small, with not many rooms and the only facility is a single restaurant. If you want to chill out this is perfect - but two days was enough for me. Everything we had from the dinner menu was wonderful - but breakfast wasn't great. The eggs are cooked in some horrid type of fat - possibly palm oil. The rooms, restaurant, beach and sun loungers were wonderful. It is quite compact, with only one restaurant so it's perfect if you want chill out time.. There may not be enough to keep you occupied for more than a few days, though. Evening meals were top notch. Breakfast not great due to cooking eggs in some hoodie kind of fat - even the poached eggs. From The moment we were greeted with the custom Sri Lankan overflowing friendliness we felt right at home in this beautiful paradise like resort. The rooms are spacious and clean, the restaurant food is delicious. Stick to the Sri Lankan loca spacialties though, I have yet to find someone in Sri Lanka who can cook a decent steak. They arranged a trip to Pigeon island for us which is straight across and only a 5 minute boat ride away. The wifi in the room is super slow and basically non-existent, much better in the reception area. But then, what do you need wifi for in paradise? The best place we stayed at during our trip to Sri Lanka. Very lovely staff and great views! A bit noisy due to construction work on premises and quite pricy - so not full score for value for money. We had a wonderful stay in our cute bungalow, away from it all on the semi-private beach. Lovely helpful staff. Only thing missing was cocktails! The food is lovely, the bar only serves beer and wine. My wife and I arrived at Nilaveli Beach resort at about 4pm all excited for a 2 night stay. We even more excited when we saw how beautiful it looked. To our disappointment we were told that we were double booked and there was nothing else they could do but upgrade us to another hotel. Reluctantly we agreed to have a look at this other hotel that was on offer but to our disappointment it didn't even get close to comparison. They young boy Sen who took us to show us the option and his manager didn't really care and just said that's all they had to offer. We eventually found another place but nothing to the comparison that we booked. The hotel we stayed at was very nice and so was there staff. We were also told by the hotel staff that they heard of this happening at Nilaveli Resort often. Excellent place for a few days. Probably better suited to couples than solo travellers. Superb rooms, though not much to do at night. Huge stretch of unspoiled beach front. I guess this is part of nilavali's attraction as it won't stay that way for long. Nivali Beach Resort was a beautiful place to stay, kicking back on a deck chair and unwind at the conclusion of our Sri Lankan adventure. We loved the fact fishermen were active in front of the hotel and we could swim. The rooms were beautiful and food at restaurant amazing! We cannot fault the service. What could improve is a better internet coverage- they have dialog in each room, but it kept needing to be recharged. Air-conditioning is quite loud- fan has three settings, but they are all the same. We think perhaps units are too large for room. Possibly a swimming pool to lift it to a five star rating and a liquor licence. We very much enjoyed our stay at Nivali Beach resort and have no hesitation in recommending this hotel to others.